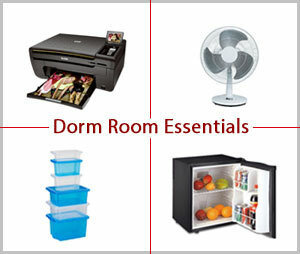 Wondering what to bring to your dorm? Dorm rooms are small, like cabin small. Wait, no, smaller than that. Like closet small. Eh… no, like spacious bathroom small. Printer – It’s a good idea to have a wireless printer for you and roomy. Mini fridge – If your room doesn’t come equipped, it’s worth buying one. Where else will you store your beer leftovers? Futon – If you have space, a futon will give visitors a place to sit. Wall hangers – Your closet space will be tiny, and the floor will be cluttered within five minutes of moving in. Putting a basket on the wall, like for your keys or remote, might help keep things orderly. One or two uniquely-useful things – Don’t bring everything you can imagine coming in to play one day. There’s no space for such tenacity. However, do bring one or two things, like a toolbox, an iron or a small vacuum. You can barter it out to those in need, and get favors (like a basketball pump) in return. Spices – If you like to put something on bad food to make it taste okay, bring that, because you’ll need it. Two big, thick towels and a laundry bin – Large towels go longer without needing to be washed, and a collapsible laundry bin is a MUST. Earplugs – Your roommate might snore, or he might stay up late every night watching bad TV and slurping down hot dogs in alfredo sauce (sigh… not good times). A safe – Bring a small safe to store your passport, cash, $1,000 watch, etc. Even if your roomy is a saint, the shady-looking fellow down the hall might not be. Small items, generally – If you have a choice between a tiny TV and a big screen, go with the tiny. If you must decide between your subwoofer or headphones, go with headphones. Stay small; you won’t regret it. Also, make sure to check with your roommate, so you two can ensure that you don’t both bring the same things. You do not need two ironing boards.